Boone Children’s Gallery facilitators know exactly what to do when painter Aaron Howard walks through the door. While one of us seats our frequent, longtime visitor, another places a small stack of paper next to his paint tray, while yet another retrieves two water pitchers: one full and the other empty. Mr. Howard prefers to change his own water bowls, so that the act doesn’t interrupt his zen-like painting process. To describe him as prolific would be an immense understatement. Mr. Howard completes painting after painting with a consistent graceful and gestural swoop of the hand, a simple and seamless action commanding the brain, controlling the hand, touching the paper; over and over. I’ve watched him so often that I can easily recall the movement. I can picture the way he holds his brush. His painting sessions in the Boone Children’s Gallery often focus on similar motifs: faces with exaggerated features, abstract shapes that consist of multicolored strokes laid the instant the mind settles on their shapes, and studies for future paintings or sculptures. After a while, an enigmatic, seemingly automatic smile spreads over Aaron’s face as he slips into his painting, churning them out like an assembly line. The latter may be only slightly different than the one that came before; Mr. Howard uses the Boone’s ample supply of yellow paper as a tool to explore instantaneous artistic expression, set free without the insecurity of mistake or material shortage. He says that the materials help him to activate new thinking. Once he gets going, gallery facilitators monitor his progress, check his supplies, and gently move his paintings to clear space for more. The facilitators are careful as not to disturb but still letting him know we’re there. Some days, we have the opportunity to sit down and talk with Mr. Howard. One of the reasons he keeps coming back is the fast pace of the gallery; he only has time to express the reflection of an object, rather than the object itself. Sometimes the face will change after he’s finally looked up and realized his subject has left and been replaced. Sometimes, once he has finally looked up from his painting, his subject has left and been replaced by another, but he keeps painting making only slight contour adjustments. Mr. Howard has shared stories with us about everything from learning under James Turrell while studying at Claremont Graduate University in the 1970s to difficult times as a child, when he used art as a means to escape. When we’re lucky, he comes prepared with old clippings from the Los Angeles Times (culled from the days he designed page layouts for the paper), or with photographs of the acrylic sculptures he fabricated in the 1980s when he was showing his art all around the world. He’s shared memories of his time as a combat artist in Vietnam, where his task was to produce works of art that gave the public an idea of what it was like to be a wartime solider. He often wraps up conversations with beautifully inspiring phrases like, “I would rather put creativity in orbit than have to recycle absurdity,” or “Art is the clay of the universe molded into the sanctuary of mankind,” that leave you feeling introspective and deep. While he paints he studies fellow patrons near him, using their faces to shape his paintings. One of the reasons he keeps coming back is the fast pace of the gallery; he only has time to express the reflection of an object, rather than the object itself. Sometimes the face will change after he’s finally looked up and realized his subject has left and been replaced. Sometimes, once he has finally looked up from his painting, his subject has left and been replaced by another, but he keeps painting making only slight contour adjustments. Almost 40 years after the completion of his MFA, Mr. Howard continues to have high artistic aspirations and goals that involve studies for large-scale paintings and massive geometric sculptures. He maintains a personal painting studio, but chooses to visit the Boone Children’s Gallery, even still. We are so thankful for the evidence that Mr. Howard provides almost every day that the Boone Children’s Gallery is not exclusively a place for children and their families. It is a place for creativity, for mediation, for searching through art-making, conversation and friend making. We welcome visitors of all ages, in all numbers, with any level of painting experience. Just ask Mr. Howard. This Weekend at LACMA: Timeless Mexican Cinema, Free Workshops, Free Music, All-You-Can-See Art, and More! Cinephiles and the curious alike will have a ball this weekend at LACMA’s home and mobile theaters. On campus at the Bing Theater, we enter the second week of The Golden Age of Cinema, the exhibition film series which draws from work found in and related to Under the Mexican Sky: Gabriel Figueroa—Art and Film. Friday night’s double feature includes La Perla (The Pearl) at 7:30 pm and Rosa Blanca (The White Rose) at 9:10 pm. John Steinbeck’s literary classic, The Pearl, the tale of a pearl diver and the greed of man, comes to life on screen with direction by Emilio Fernández and cinematography from Gabriel Figueroa. Over a decade later Figueroa joined with writer/director Roberto Gavaldón to create Rosa Blanca, a scathing commentary on American imperialism. The series continues into Saturday evening with two more films from the “Fourth Muralist.” Dias de Otoño (Autumn Days) brings back Gavaldón and Figueroa in a chilling psychodrama and Distinto Amanecer (Another Dawn) at 7:30 pm is a stylish film noir that reveals Figueroa’s adaptability as a master visual collaborator. Then, of course, see the exhibition itself, Under the Mexican Sky: Gabriel Figueroa—Art and Film, for a comprehensive and spirited understanding of his artistic work and cultural impact. On the road in nearby Altadena, the Altadena Art + Film Lab at Charles White Park presents two nights of free, outdoor film. Friday night The Illusionist (L’Illusionniste) plays at 8 pm, and on Saturday Akeelah and the Bee shows at 8 pm. What’s more, visitors can participate in Oral History Drop-in sessions Friday, Saturday, or Sunday, as well as a free Soundscapes Workshop on Saturday at noon, where you get to identify and capture the aural elements of your environment. Free, live music is also on queue for the weekend. Jazz at LACMA present the virtuous vocal talents of Dwight Trible at 6 pm on Friday. Sundays Live features the strings of Capitol Ensemble performing work from none other than Wolfgang Amadeus Mozart at 6 pm on Sunday. Families visiting on Sunday should also make time to join in on Andell Family Sundays at 12:30 pm. Children and their parents are invited to imagine and create a textile art project, as mastered in Pinaree Sanpitak: Hanging By A Thread (see it before it closes on Sunday!). Finally, a trip to the museum wouldn’t be complete without seeing some of the newest exhibitions and installations on display. In the Hammer Building, Shaping Power: Luba Masterworks from the Royal Museum for Central Africa includes intricate and stunning wood carvings from Africa. In the Pavilion for Japanese Art, Lingering Dreams: Japanese Painting of the 17th Century transports you to a different time, place, and aesthetic from our own. In the Art of the Americas Building, The Ancient Maya World: Masterworks from the Permanent Collection includes 38 Mayan masterworks from A.D. 250 to 900. And in the Ahmanson Building, Down to Earth: Modern Artists and the Land, before Land Art explores the connection between humans and the earth. So much to do and see. On the fourth floor of the Ahmanson Building, 18 hammocks hang in a dark gallery. They look like rare exotic vegetation crafted from the printed cotton textile, the paa-lai. It’s easy to imagine them as forms of the monsoon: terrifying, consuming waters transforming the Chao Phraya River that snakes through Bangkok like some mythic creature. But of course, Pinaree’s art allows all manner of imagery to be contained, and is sometimes so simple as to reveal and mystify all at once. The hammocks yield to the curvature of the breast, a constant icon of Pinaree’s work. In the subdued gallery, the work occupies the space in a commanding way—the room, in its dark rigidity, is complemented by soft forms that resemble giant DNA strands, which possesses a spiritual air that undoubtedly challenges even the glorious Vishnu statue that Sanpitak’s work surrounds. Trained in Japan and a great admirer of the artist Eva Hesse, Sanpitak’s work often projects the female form as not only an enduring physicality, but also a dynamic spirituality—the Earth Mother (Preah Thorani, the Earth goddess in mythology), one is led to assume. Thailand is a country where Theravada Buddhism (“the way of the elders”) is the national religion. Buddhism is over-present, in this land literally festooned with prangs and stupas, opulent temples, and golden Buddhas. It should not go unremarked, however, that for many older Americans, the image of Siam was through Hollywood’s prism of the frolicking fantasy, the lyrics and drama of Roger and Hammerstein’s The King & I, an unflattering caricature of Rama V, who, for many Thais, is part-god. While modern perceptions of Bangkok are often filtered through tourist scrims as a land of colorful exoticism and lascivious playgrounds, the city’s denizens, and, in particular, the artists, are deeply engaged in Thailand’s cultural awareness. Pinaree Sanpitak makes no claim as a Buddhist, but her work appears to be suffused with the forms of the religion, such as the stupa and the breast, and somehow with its ideals. Conceptualism, especially in an Asian country that is steeped in the all-consuming ancient teachings of Buddhism, is viewed as somehow more remarkable and relevant. Here a new voice enters an ancient stage and makes present the essence and language of a humanism that places the female presence at the very core of the culture. As museum visitors have made clear to me upon entering the space of the exhibition, the sensuous and curvaceous hammocks seemed to elicit all manner of illusions. There was testimony about pleasure, rest, stillness, flight, secret messages, and the cradle of mother’s embrace. In their shadow form, the figures are like pods, cocoons, or crescent moons as their melancholy silhouettes pattern the carpet. Perhaps in setting out the extraordinary clues in her work, and presenting art that is cloaked in modernism and using the tension of delicate, maternal materiality that references the very nature of our tenuous beginnings and endings, Sanpitak presents a place of union. In a haunting unknown, the hammocks speak to the thin existential air that art and solace can occupy in a world of joy and sorrow. Station to Station arrives in Union Station this evening, bringing with it the pop-up shop for Art Catalogues. 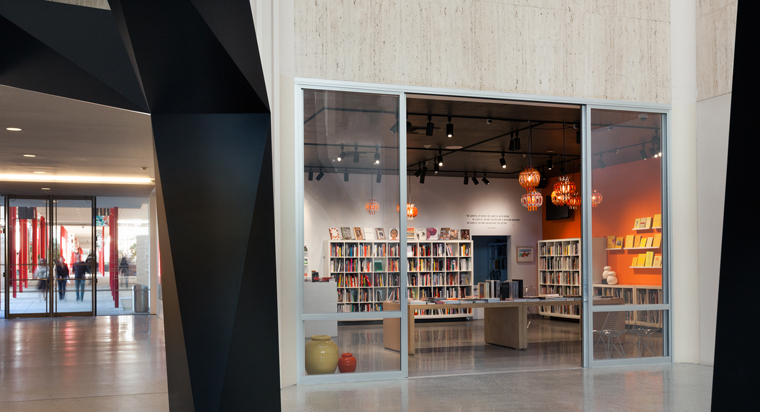 Founded in 1977 by Dagny Corcoran, the bookstore specializes in current and out-of-print art books and exhibition catalogues, and is currently housed at LACMA, adjacent to Tony Smith’s Smoke. In anticipation of the event in Los Angeles this evening, Unframed‘s Linda Theung asked Dagny about her upcoming experience as part of Station to Station. What are you learning about an itinerant version of a bookstore vs. a brick-and-mortar setup? What a great idea Doug Aitken had to create a kind of nomadic collaboration of creative people, and the challenge of thinking about how to respond to being “itinerant” is very interesting for me. Doug’s strong point is managing to intercalate many moving parts (remember “threading the needle” on horseback? ), but because he himself is an artist, he does not micromanage. I have to figure out how to get books to Winslow (where I am meeting the train), how to set up shop without knowing where that will be within the installation, how to manage to be a salesgirl as well as part of the audience. It has made me realize that Art Catalogues can—probably should—be everywhere, and it has helped me think about the e-commerce store that Amy Heibel is creating for Art Catalogues. A good question is how to make a virtual store as interesting as a brick-and-mortar one. How does having artists whose books you’re sharing change the conversations you’ve having about the printed page with visitors/participants? It’s perfect being at LACMA, and simultaneously participating in Station to Station, because I am in the presence of all the artists, curators, films, exhibitions, and . . . unexpected encounters . . . that happen in both situations. It gives me ideas. Hosting the artists’ talks at the museum is wonderful because often people find Art Catalogues for the first time. It’s like, “Huh? What’s going on here? Where is the gift store?” Then they sort of hang around and listen and look at the books, and many times the door just opens for them, and they get it, and the’re hooked.Presenting books on the train, in the on-board llibrary, was also very much of an opportunity for me to learn more about the participating artists. I’ve become very interested in Pierre Huyghe and Mathias Poledna, artists I knew, of course, but have now begun to think about much more. And I discovered artists I didn’t know, as well. Is the book setup different from city to city, or does it stay pretty consistent throughout the run of Station to Station? I haven’t the faintest idea! But I imagine it will have to be pretty fluid. The yurts change and the whole idea is evolving daily. For the pop-up stores in Winslow, Los Angeles, and Oakland, I’ll have books by the participating artists and many others that I think are relevant to the the themes of place, film, art, music and food–the questions that Doug is investigating with the Station to Station project. I recently caught a showing of John Logan’s play Red, which first premiered in London in 2009, making its debut on Broadway one year later. The performance focuses on fictional exchanges between artist Mark Rothko and his young assistant in 1958, a year when Rothko accepted a $35,000 commission to paint a number of murals for a new restaurant in New York City. Born Marcus Rothkowitz a 110 years ago today, Mark Rothko was an émigré from Latvia who came from humble beginnings. He attended Yale University in 1921 on scholarship, only to drop out a few years later to focus on his art in New York City. After working with the Arts Students League and the Works Progress Administration (under the Federal Art Project) in the 1920s and 1930s, respectively, Rothko had achieved critical acclaim with his color-field paintings, a style of Abstract Expressionism in which works typically comprised of large, solid planes of color rendered on flat surfaces. By the time Rothko was invited to participate in the restaurant commission, his name was already well established in the Abstract Expressionist circles, which emerged in the United States and included painters such as Adolph Gottlieb, Clyfford Still, Robert Motherwell, and others. Red is a drama that offers fictional insight as to what might have been the reason Rothko quit such a hefty commission at the time. One of the more memorable exchanges in the performance is the volatile tête-à-tête (mainly by Rothko) when he asks his young assistant, Ken, “What do you see?” after looking at one of his murals. Ken’s response is eponymous with the title of the play, Red. In the performance, the audience witnesses Rothko, the expert, training the novice with verbally explosive discourse in what would have been typical Rothko fashion. So now I ask you readers: what do you see? Former LACMA curator and community activist Cecil Fergerson believed in the power of art as a lightning rod for discussion and, most importantly, a catalyst for change. Moving through an incredibly challenging period in America, Fergerson left an indelible mark on the history of art at LACMA. When I arrived at LACMA at the beginning of 2010, one of my earliest encounters was with Cecil Fergerson. I had been told many things about this man and was happy he had agreed to sit down with me at his home. Sure, there was mutual admiration from a shared vocation, but it was also the familiar way that the older generation greeted young newcomers who share mutual friends. Perhaps feeling her husband could come off as a little gruff, his wife, Miriam, was welcoming and warm, as if she were my own grandmother. Cecil enjoyed talking, most especially about art and activism. I didn’t get back as much as I would have liked, but we did manage to share some stories along the way. The first sight of his kufi and long dashiki at public events promised fireworks, or at least there was going to be a lively riposte at some point! Fergerson’s story was improbable, but true. He was born in Oklahoma in 1931 and moved with his family to Los Angeles in 1939. He started working at LACMA—which was still a part of the Los Angeles County Museum of History, Science, and Art in Exposition Park—in 1948 as a janitor. By 1964, he became an art preparator and was later named a curatorial assistant in 1972. In between, at the height of the civil rights movement, Fergerson and his colleague Claude Booker began calling for the presence of black American artists in the museum’s exhibitions. Together they formed the Black Arts Council in 1968. The group’s work led to a series of lectures and two exhibitions: Three Graphic Artists: Charles White, David Hammons, and Timothy Washington in 1971 and Panorama in 1972. The latter included artists Noah Purifoy, John Outterbridge, and Betye Saar. The Black Arts Council’s efforts led to LACMA’s initiation and support of the exhibition Two Centuries of Black American Art in 1976, which traveled to the High Museum in Atlanta, the Dallas Museum of Fine Arts, and the Brooklyn Museum. Before organizing these two exhibitions, Fergerson had made his mark on another important LACMA project, assisting with the Art and Technology Program, which traveled to Expo ’70 in Osaka, Japan. Cecil traveled with the show. Fergerson retired from the museum in 1985 and began his second career as an activist curator and organizer of exhibitions in diverse spaces around Los Angeles, always promoting black artists. If he were not an invited participant in recent years, he was surely there agitating as a respondent. The long-term loan of a work by John Biggers was celebrated by a panel discussion with Fergerson’s peers Samella Lewis and Bill Pajaud, in addition to the Houston art collector Bill Perkins. In 2011, LACMA held a 35th-anniversary celebration for Two Centuries of Black American Art, with a keynote from David Driskell (who also led the panel discussion), the scholar Bridget Cooks, and Fergerson. In 2012, Austen Bailly led a discussion, “Building Collections of African American Art,” in which Halima Taha moderated a discussion with collectors Jesse Williams and Aryn Drake-Lee, Lyndon and Janine Barrois, and Paul and Linda Gotskind. LACMA also acquired an important document from the era of Fergerson’s Black Arts Council. The Ruth Waddy Sketchbook consists of 130 drawings by various artists from 1968 through 1981. In fact, Waddy, Lewis, and Fergerson formed a kind of triumvirate of voices and support for L.A. artists. You are currently browsing the Unframed The LACMA Blog blog archives for September, 2013.